Looks like CNET Asia got a different press release from the one I got late last night. 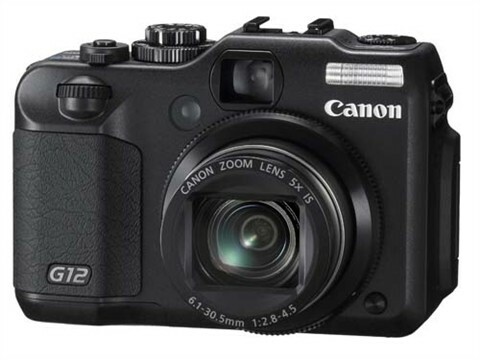 Theirs apparently had information pertaining to the not-announced G12, the latest in Canon’s line of compact manual cameras. Well, there’s no putting the cat back in the bag, especially when you have rumor sites ready to pounce and immortalize your error in a screenshot. Here’s what was revealed. The G12 will feature the same 10-megapixel CCD as the S95 from last night, though the lens doesn’t appear to be quite as nice: 5x zoom and f/2.8-4.5 is certainly nothing to scoff at, but f/2 would have been nice. The LCD is a 2.8″ swivel-and-tilt one (likely the same 480×320 one as before), which should come in handy when you’re using the brand new 720p video mode. It’s got all the usual G-series stuff: manual exposure, lots of dials, image stabilization. It also has the in-camera “HDR” mode using bracketed exposures. There are probably a few details we’re missing, but we’ll fill those in once the G12 gets its official announcement. I’m expecting that to be alongside the 60D in a week or so, just before the big Canon expo. The 26th, we’ll say.